Today, we will look at some tips for the Asset Tree functionality in On Key. Transactions in the Asset Tree have been made easy in On Key 5. You are able to create transactions from the selected node in the tree by using the right click function. Your cursor stays at the point of transaction and no unnecessary movement is required. 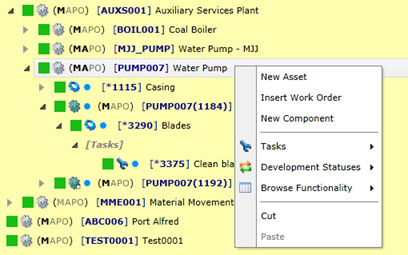 All you have to do is right click on the asset and select Insert Work Order on the menu. It is also possible to use the breadcrumb trail at the top of the tree to navigate by selecting the relevant object. This is helpful where you have a long list of child objects from which to select. By clicking on the dropdown, button you will be presented with the asset path which can be used for reference. The asset tree forms the backbone of your computerised maintenance management system (CMMS) and the ease of navigation in the On Key 5 Asset Tree will save you time and provide you with the correct information without fuss.